Dec. 03, 2007: Mark your calendar: The best meteor shower of 2007 peaks on Friday, December 14th. 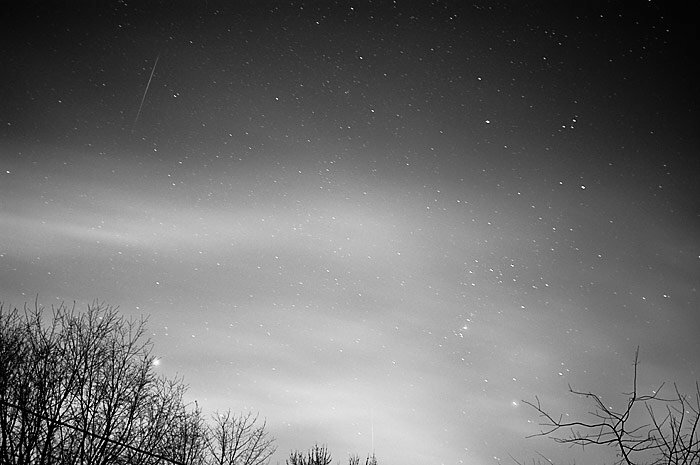 The Geminids are not ordinary meteors. While most meteor showers come from comets, Geminids come from an asteroid—a near-Earth object named 3200 Phaethon. "It's very strange," says Cooke. How does an asteroid make a meteor shower? Comets do it by evaporating. When a comet flies close to the sun, intense heat vaporizes the comet’s "dirty ice" resulting in high-speed jets of comet dust that spew into interplanetary space. When a speck of this comet dust hits Earth's atmosphere traveling ~100,000 mph, it disintegrates in a bright flash of light—a meteor! Asteroids, on the other hand, don't normally spew dust into space—and therein lies the mystery. Where did Phaethon's meteoroids come from? One possibility is a collision. Maybe it bumped against another asteroid. A collision could have created a cloud of dust and rock that follows Phaethon around in its orbit. Such collisions, however, are not very likely. Cooke favors another possibility: "I think 3200 Phaethon used to be a comet." Exhibit #1 in favor of this idea is Phaethon's orbit: it is highly elliptical, like the orbit of a typical comet, and brings Phaethon extremely close to the sun, twice as close as Mercury itself. Every 1.4 years, Phaethon swoops through the inner solar system where repeated blasts of solar heat could easily reduce a flamboyant comet to the rocky skeleton we see today. If this scenario is correct, Phaethon-the-comet may have produced many rich streams of dust that spent hundreds or thousands of years drifting toward Earth until the first Geminid meteors appeared during the US Civil War. 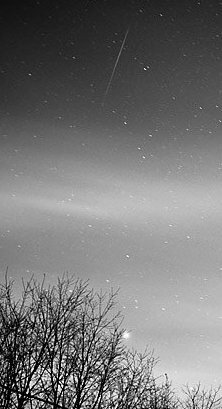 Since then, Geminids have been a regular shower peaking every year in mid-December. "3200 Phaethon is flying past Earth just a few days before this year’s Geminid meteor shower," notes Cooke. On Dec. 10th, Phaethon will be about 11 million miles away shining like a 14th magnitude star in the constellation Virgo: ephemeris. That's too dim for the naked eye, he says, but a good target for amateur telescopes equipped with CCD cameras. Cooke doesn't expect the flyby to boost the Geminids—"11 million miles is too distant to affect meteor rates"—but the Geminids don't really need boosting. "It's always a great shower," he says. "Don't miss it."